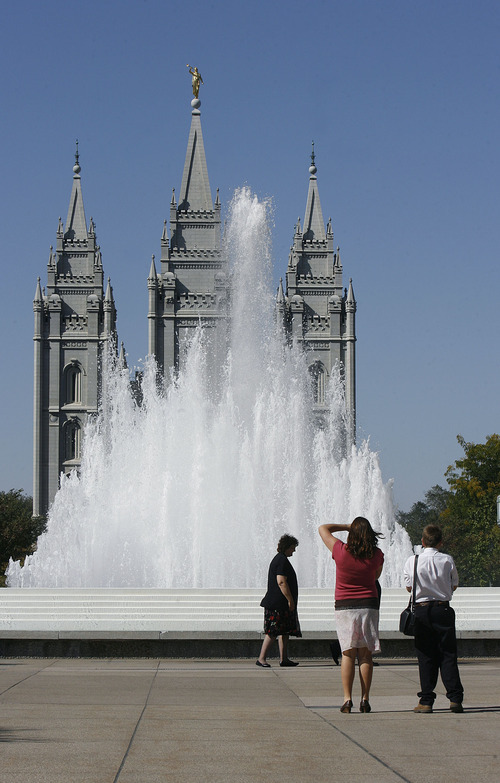 General Conference • Historic shift will beef up proselytizing force while altering Mormon and Utah culture. Scott Sommerdorf | The Salt Lake Tribune A man makes a photo inside the Conference Center prior to the start of the afternoon session of the 182nd Semiannual General Conference, Saturday, October 6, 2012. 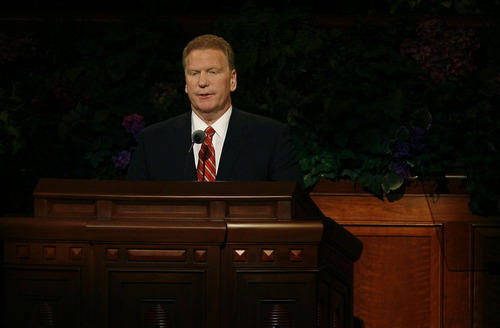 Scott Sommerdorf | The Salt Lake Tribune Mormon Church leader Craig C. Christensen, of the First Quorum of the Seventy, speaks at the 182nd Semiannual General Conference, Saturday, October 6, 2012. 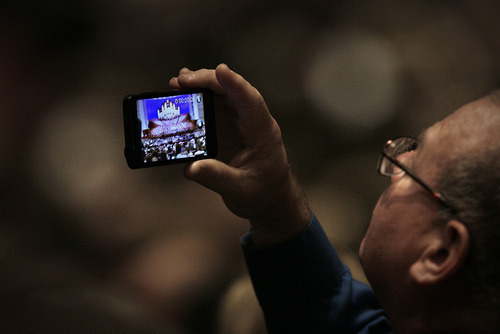 Scott Sommerdorf | The Salt Lake Tribune A man in the audience makes a video of the 182nd Semiannual General Conference, Saturday, October 6, 2012. Scott Sommerdorf | The Salt Lake Tribune President Thomas S. Monson addresses the 182nd Semiannual General Conference, Saturday, October 6, 2012. He announced the lowering of age miniumums for LDS missionaries. For young men the age is now 18, and for women it is now 19, effective immediately. Scott Sommerdorf | The Salt Lake Tribune President Thomas S. Monson laughs as he tells a story about his mother as he addresses the 182nd Semiannual General Conference, Saturday, October 6, 2012. He announced the lowering of age minimums for LDS missionaries. For young men the age is now 18, and for women it is now 19, effective immediately. Scott Sommerdorf | The Salt Lake Tribune Apostle Jeffrey R. Holland speaks during a press conference held at the Church Office building about the change in missionary age, Saturday, October 6, 2012. 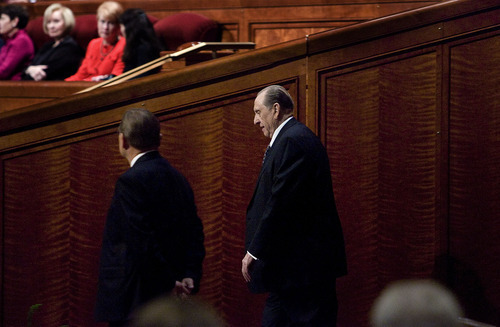 Scott Sommerdorf | The Salt Lake Tribune President Thomas S. Monson arrives at the 182nd Semiannual General Conference, Saturday, October 6, 2012. He later announced the lowering of age minimums for LDS missionaries. For young men the age is now 18, and for women it is now 19, effective immediately. 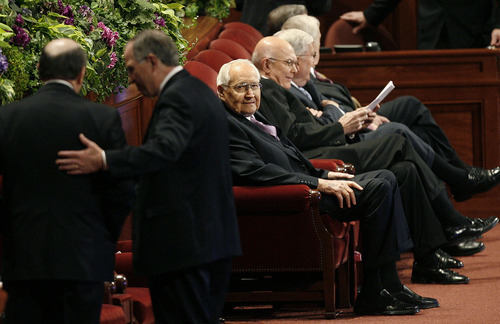 Scott Sommerdorf | The Salt Lake Tribune Elder L. Tom Perry, a member of the Quorum of the Twelve Apostles, center, sits with other members of church leadership prior to the beginning of the afternoon session of the 182nd Semiannual General Conference, Saturday, October 6, 2012. 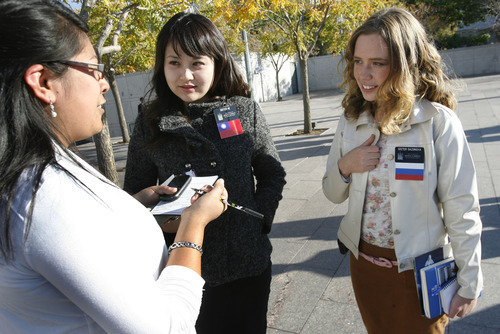 Scott Sommerdorf | The Salt Lake Tribune Sister He, left, a missionary from China and Sister Sazonova, a fellow LDS missionary from Russia, speak to a woman about the church outside the 182nd Semiannual General Conference, Saturday, October 6, 2012. Scott Sommerdorf | The Salt Lake Tribune The Miler family from South Jordan has their photo taken in Temple Square before the start of the afternoon session of the 182nd Semiannual General Conference, Saturday, October 6, 2012. Scott Sommerdorf | The Salt Lake Tribune Elder Russell M. Nelson spoke during a press conference held at the Church Office building about the change in missionary age, Saturday, October 6, 2012. Scott Sommerdorf | The Salt Lake Tribune Elder Russell M. Nelson spoke during a press conference held at the Church Office building about the change in missionary age, Saturday, October 6, 2012. Scott Sommerdorf | The Salt Lake Tribune Women on their way to the 182nd Semiannual General Conference pass by a statue of Joseph and Emma Smith outside the Church office building, Saturday, October 6, 2012. 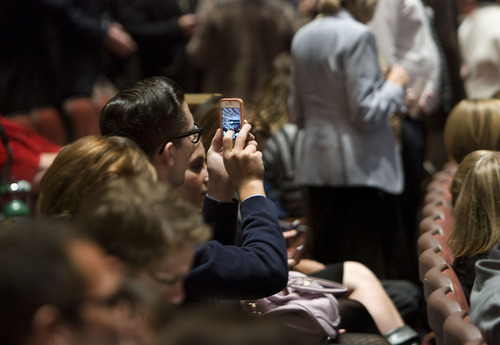 Scott Sommerdorf | The Salt Lake Tribune People make photos in Temple Square prior to the afternoon session of the 182nd Semiannual General Conference, Saturday, October 6, 2012. Scott Sommerdorf | The Salt Lake Tribune The LDS Temple before the start of the afternoon session of the 182nd Semiannual General Conference, Saturday, October 6, 2012. Call it a change for the ages. 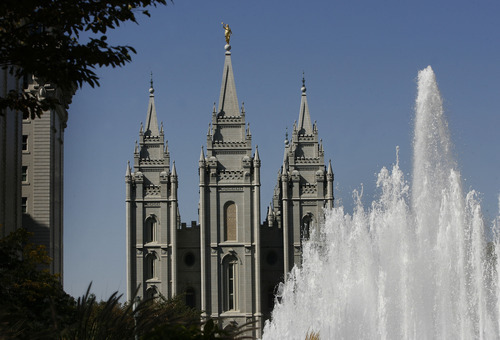 In a surprising move that promises to transform Mormon social and spiritual dynamics, with aftershocks rippling throughout Utah culture and beyond, the LDS Church announced Saturday a historic policy shift to bolster its proselytizing force. The Salt Lake City-based faith is lowering the age of full-time missionary service to age 18 for Mormon men (down from 19) and 19 for women (down from 21). 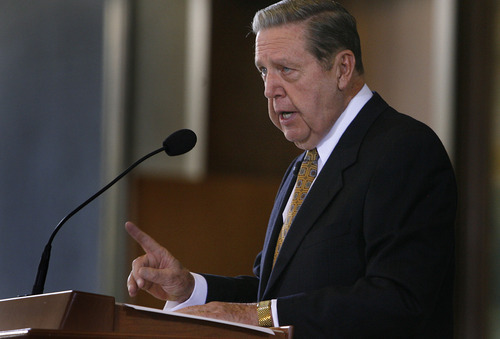 "The Lord is hastening this work," LDS apostle Jeffrey R. Holland said at a news conference, "and he needs more and more willing missionaries." The church is counting on this change to dramatically increase the ranks of its full-time missionaries, currently more than 58,000 worldwide. It will also bring sweeping changes to an array of areas  from university sports recruiting to college admissions, family finances to dating and marriage patterns, missionary preparation and training to career planning. It also might help the LDS Church hold on to its young people, a number of whom leave the faith once they hit college. Perhaps the most significant impact will be on Mormon women. "I am overjoyed," LDS writer and religion scholar Joanna Brooks said through tears. "This changes the narrative for young Mormon women in pretty fundamental ways. It uncouples church service from the expectation of marriage and motherhood and teaches young women they should take responsibility for knowing their faith." "It will change the Young Women's program for us," Brooks, who serves in her San Diego LDS Young Women's Presidency, said in a phone interview. "It says to all of us it's time to serve shoulder to shoulder." Neylan McBaine, founder of the Mormon Women Project, said that the change symbolizes "equal opportunity to gain both cultural and spiritual educations, serve in our external communities, and put those experiences ahead of a rush to marriage." It "will relieve the stigma of unmarried [LDS] college women," McBaine wrote in an email, and that would "ultimately result in stronger, more equal marriages and more effective church governance in future generations." LDS Church President Thomas S. Monson kicked off the faith's 182nd Semiannual General Conference on Saturday with the ground-shifting announcement. 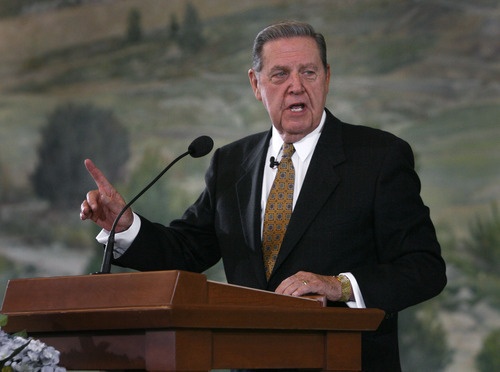 "Effective immediately, all worthy and able young men who have graduated from high school or its equivalent, regardless of where they live, will have the option of being recommended for missionary service beginning at the age of 18, instead of age 19," said Monson, considered a "prophet, seer and revelator" by millions of Mormons. "I am not suggesting that all young men will  or should  serve at this earlier age. Rather, based on individual circumstances, as well as upon a determination by priesthood leaders, this option is now available." 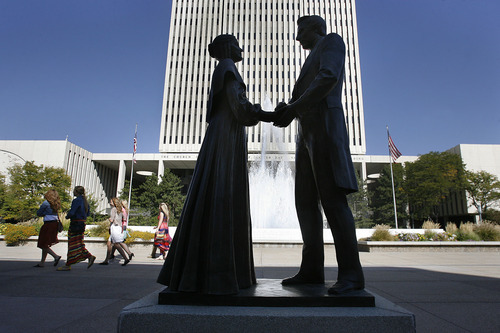 By lowering the age for female missionaries to 19, LDS officials retained an age difference between the genders, Holland said, because "there needs to be at least some separation." When asked why church leaders didn't equalize the length of mission service at two years  women will continue to go for 18 months  Holland said, jokingly, "one miracle at a time." He did note that officials had considered doing so but wanted to see how this change played out. The impact is already being buzzed about in LDS living rooms and chapels, across the Mormon blogosphere and throughout social media. Sherrie Hall Everett and her daughter, Jessica, cried when they heard the news. For Jessica, who is almost 17, it means being able to serve as a missionary two years sooner. "I was so worried I may not be able to go if I were somewhere different in my life at that point [age 21]," said Jessica, a Provo resident. "And now that it is at age 19, I can do it right out of high school and after a semester of college." Everett said she also thought of the young women she works with in her LDS ward, and how many would be able to serve sooner while benefiting from the personal growth that missions can afford. Emily Stephenson, a Provo resident attending Utah Valley University, said she was eager to go on a mission when she was 19, saving up money and taking missionary-preparation classes. But by the time she turned 21, her passion had cooled. "If only they would have changed it sooner," Stephenson said, "who knows, I could be in another country serving or already be done with a mission." Women weren't the only ones to praise the shift. A number of young men believe the change will prompt more of them to go on missions as well. "I had to wait for a year," said Elder Win Wright, 19, an Arizona Mormon now serving a mission in Utah, "and it was kind of distracting." Mike Salazar, who is 23, called the change "inspired." Salazar, who was originally from Kentucky, went on his mission to Mexico when he was 19. "If I had of gone at 18, I wouldn't have messed up so much between 18 and 19," Salazar quipped. "I was going to go to a semester of school [before my mission], but now I'm not so sure," said Jordan Larsen, 17, of Idaho. "I could leave the day after I graduate. I'll have to put some thought into that now." Mormon parents welcomed the change  though, in many cases, it led to practical questions. "We're wondering about the maturity of an 18-year-old, somebody who hasn't gone to college or been away from home," said parent Phil Holdsworth, of Lehi. 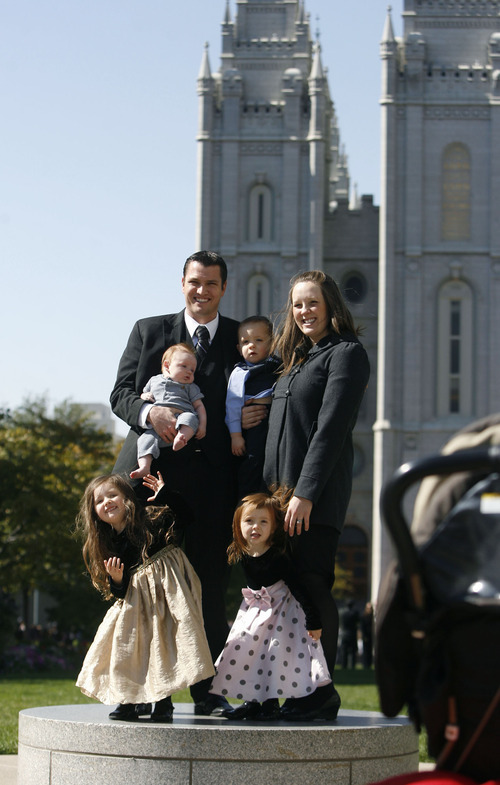 Stephen Wilson, of Leeds in southern Utah, is excited, but with five kids, several of whom are teenagers, he'll have to start thinking more about how to ensure his children are financially ready sooner for missions. "The main thing that was on my mind [when the announcement was made]," Wilson said, "is you're going to have to start replanning." To David Stewart, an LDS physician in Las Vegas who has spent years charting church growth, the shift is a "two-edged sword." "Yes, we can send young men out there before they engage in some bad behaviors," Stewart said in a phone interview. "But there is a big difference in maturity between 18 and 19 years old. Eighteen-year-olds haven't been independent, haven't learned to get along with roommates, and haven't yet functioned in society." That will put more pressure on Mormon mission presidents. In fact, Holland said, the church is further upping the ante for these presidents. It is cutting by a third the amount of time missionaries stay in training centers  including the flagship facility in Provo  to accommodate the expected increase in numbers. Missionaries will then arrive in their assigned areas for a 12-week "immersion program," which will be directed by their missions. But LDS officials are not worried about the maturity factor. They have already been allowing young men in 48 countries to start their missions at 18. 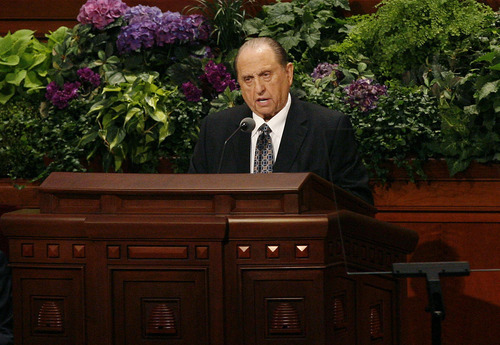 "This has been a country-specific policy," Monson said, "and has allowed thousands of young men to serve honorable missions and also fulfill required military obligations and educational opportunities." Monson said those experiences proved positive and helped spur the change. 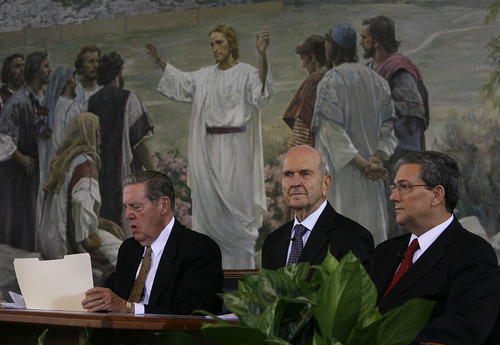 LDS apostle Russell M. Nelson, chairman of the church's Missionary Executive Committee voiced his own support of the effort during the news conference. Eighteen-year-old missionaries, he said, are "sweeter, purer, smarter." Stewart expects the change to alter the dating dynamics and social environment within Mormonism. "That may not be the [church's] intention, but perhaps it will be a byproduct," he said. "Putting missionary service at an earlier age for girls, it is likely you'll see more boyfriends and girlfriends going at nearly the same time  instead of girls sitting home waiting for their missionaries and going just as the boys come back." The result could be more wedding bells. 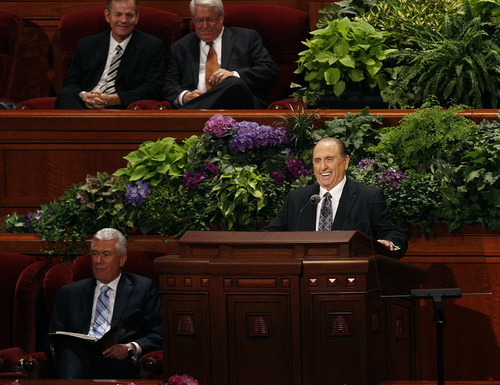 Monson and other LDS leaders have lamented that young Mormons seem to be delaying marriage, seen as the highest sacrament in the faith. Even the University of Utah and other colleges will feel the impact. "This decision will alter the landscape for the university," said U. spokesman Keith Sterling. "The U. will take a close look at what this might mean for our enrollment numbers and examine the best ways to work with these changes to make sure our new incoming students will continue to flourish." During Saturday morning's conference session, LDS apostle Quentin L. Cook recalled his mission to England in the 1960s, when the missionary age was reduced from 20 to 19. He noted that the first 19-year-old missionary in his mission was Holland, now his colleague on the Quorum of the Twelve Apostles. LDS Church President Thomas S. Monson announced Saturday that the Utah-based faith would build two more temples, one in Tucson, Ariz., and the other in Arequipa, Peru. The church operates 139 temples around the globe, with an additional 29 either announced or under construction.